After the approval for chairmen of various town committees by Karbi Anglong Autonomous Council (KAAC) authority, ward commissioner of ward no 12, Rah Kro officially took charge as the chairman of Diphu Town Committee on Monday. After taking charge as the chairman, DTC, the ward commissioners greeted Kro by felicitating him with Karbi traditional turbans. Taking to media persons at his official chamber, Kro said that he will do whatever he can for development and beautification of Diphu town. 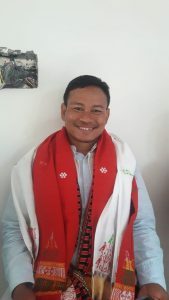 He thanked the chief executive member (CEM) of Karbi Anglong Autonomous Council (KAAC), Tuliram Ronghang, citizens of Diphu town and the ward commissioners of reposing faith in him with the responsibility of chairman of Diphu Town Committee. 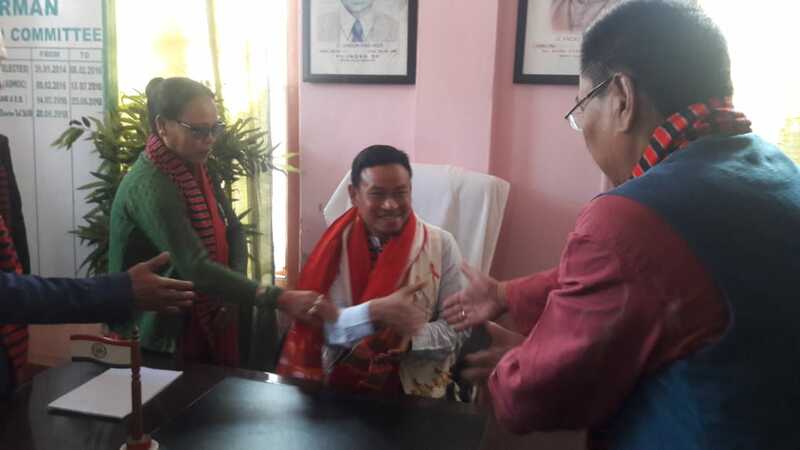 Executive member (EM), KAAC, Amarsing Tisso and Pradip Rongpi and former MLA Bidyasing Engleng also greeted the new chairman of DTC, Kro. Before taking over charge as the chairman of DTC by Rah Kro, a brief meeting was held which was attended by all the ward commissioners except that of ward no 5, Semson Terang. He has lobbied hard for the chairman’s post. The BJP top brass rank and file of the district were also absent. It is to be mentioned here that the elections to nine town committees of Karbi Anglong and West Karbi Anglong was held on January 8 and the result was declared on January 10. The KAAC authority on Monday (No.KAAC/TCA/TC ELN 2018/2017-18/2018-19) approved the names of ward commissioners as chairman for respective nine town committees. The chairman of other town committees are Binod Kumar Shah, chairman, Bokajan TC; Hemsing Teron, chairman, Bokolia TC; Kamal Brahma, chairman, Langhin TC; Pratap Handique, chairman, Howraghat TC; Birensing Teron, chairman, Dokmoka TC; Tilisram Ronghang, chairman, Donkamukam TC; Chandra Ronghang, chairman, Baithalangso TC and Biren Tisso, chairman, Hamren TC.